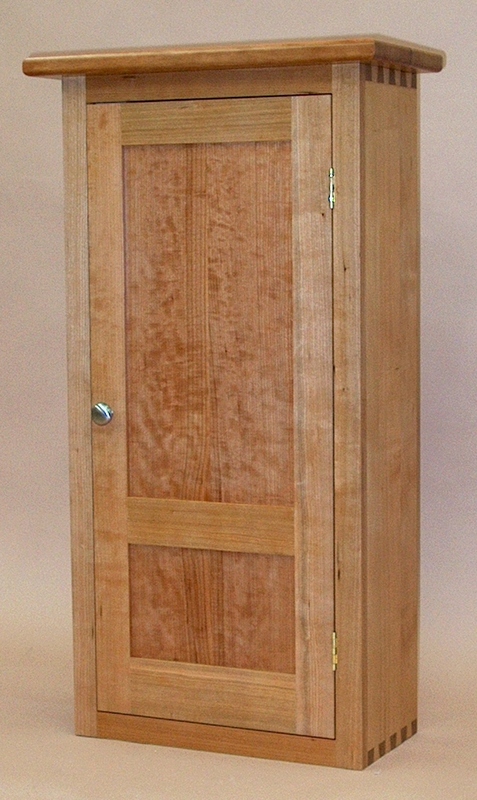 Some people openly caress a beautiful piece of wood, or open drawers to admire hand-cut dovetails. My wife and I love our two cats in part because they are constantly showing new and old character traits. New meows, new ways of playing with their toys, new places to be scratched, odd sleeping postures – all invite and reward our attention and interest. 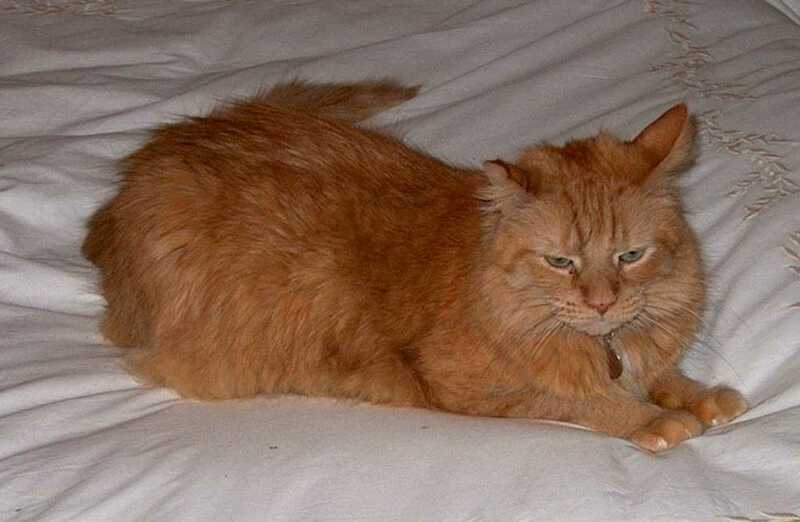 But we wouldn’t get more enjoyment from having twenty cats – too much quantity to allow quality interaction. Like a beloved spouse or favorite pet, a treasured piece of furniture also can continuously reward closer inspection and interaction. It might be figure that becomes more noticeable in winter sunlight, chatoyance (changing luster) we hadn’t observed closely before, or a scratch bead or drawer slip hidden inside. In an office or home, most of our furniture blends together, as would too many pets. But hopefully we each have one treasured piece that has special meaning, because it was passed along with family memories, was a special gift or purchase, or matches goals and aspirations. A treasured piece doesn’t have to be large or outrageously expensive, but all should have one, to add comfort and character to your personal refuge from life’s trials and tribulations. Next time you walk by your treasured piece, stop for a few moments to discover or revisit and enjoy one of its marvelous details. Although I did turn a lightpost this summer for a customer, my lathe has gotten too little use. So I’ve begun making treen or treenware – small domestic wooden items – on the lathe. Spurtles were perhaps introduced to the general public by Richard Raffan, a well known Australian turner. I’ve always thought they were an interesting project, and well suited to these challenging economic times when eating out is more of a luxury. 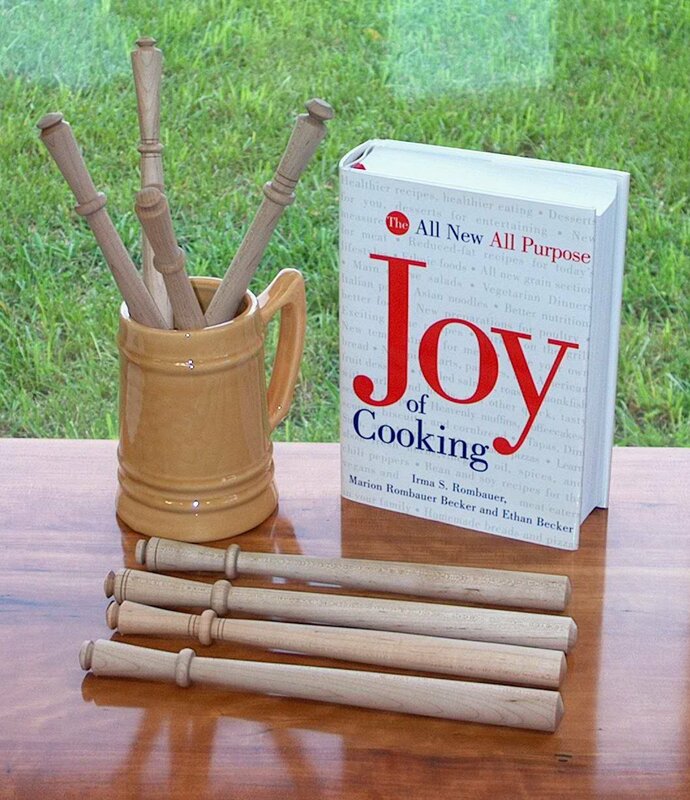 Instead, make kitchen time more rewarding by trying new recipies and using fine handcrafted woodenware to elevate the practice of food preparation. Home made soups, sauces and puddings can be more fun when stirred with a handcrafted spurtle rather than a plastic spoon! At about 10 1/2″ long, these spurtles make efficient use of what might otherwise be scrap wood. These were made from short offcuts of what will be a sideboard for a repeat customer. Relatively long and thin, spurtles are an excellent item for developing proficiency with the skew chisel. My design is not original but that shown by Mr. Raffan in his 1991 Turning Projects video. It works so well, it doesn’t seem likely it could be improved. The cuff nestles just below the fold between thumb and first finger, the narrowing helps keep it there, and the wide base more effectively swirls liquid than a thin one would. Overall, the spurtle is quite comfortable to hold and use. 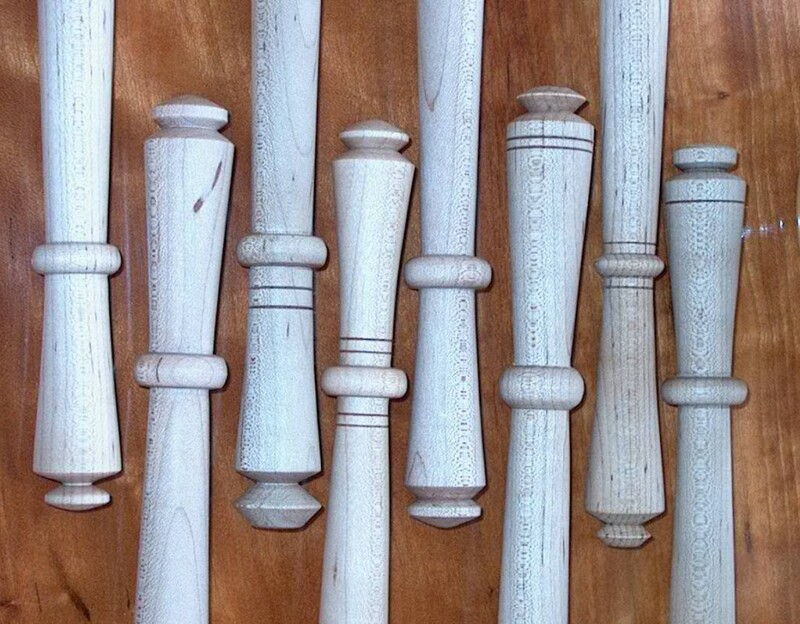 These spurtles were turned from select all white hard maple so they can stand up to regular use. But being wood, normal use should not damage pots and pans. For safe use in the kitchen, they were wiped with pure mineral oil. Hand washing would be recommended, with re-coating with mineral oil as needed. A gentleman brought in this chair considering having a similar one made using a different wood. For several days I postponed calling with a price, trying to decide why the chair was so interesting visually. Eventually I realized I kept looking back at the chair because there is so much visual tension in the design. In most chairs, the back legs are closer together than the front legs, but that is just the beginning here. The front legs lean towards the back, the seat slopes forward, and both edges of the back legs are curved, but they are not parallel. The top of the rear legs is wider than the top cross member is thick, so the back top of the rear legs are scooped to transition between the two dimensions. 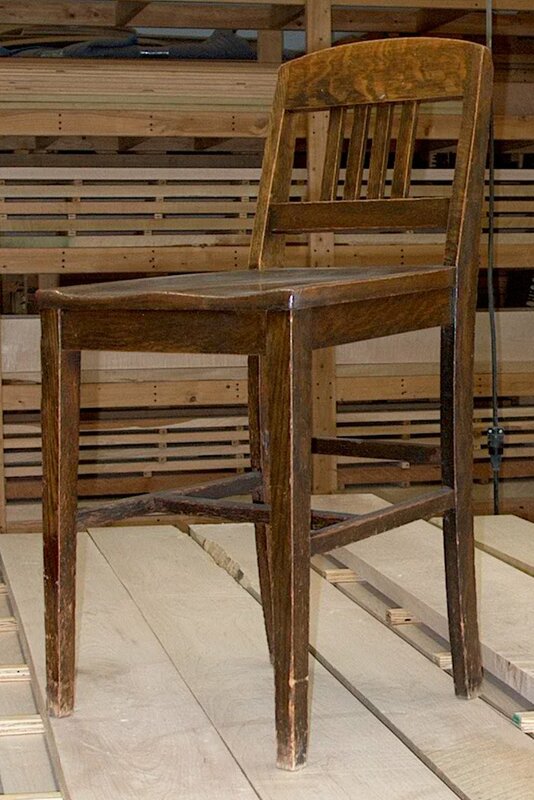 At 20 1/2″ off the floor, the front edge of the seat is higher than the normal 18-19″. With the pronounced seat slope, I wonder if the chair was designed for a particular use, perhaps paired with a drafting table. The owner finds the chair very comfortable, but about 1 1/2″ too tall. 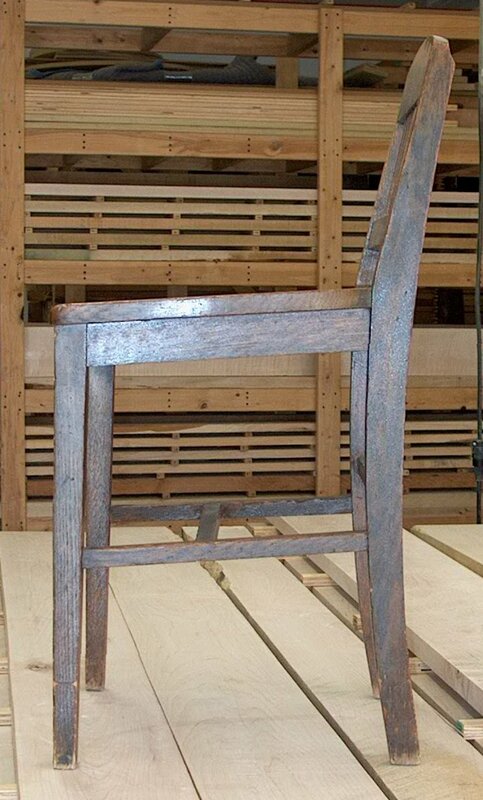 If another is made, it would use primary and accent woods to match the intended use and immediate surroundings. Sometimes a design can be just unique enough constantly to invite closer examination and study. In certain situations this uniqueness can be a feature, othertimes a distraction. But this chair has been a delight to have in the workshop these last few days. The pivoting harp on this piece made in the style of French provincial vineyard tables is a smoothly flowing curve from top to bottom. The plan was found in a modern publication, but the half lap joint at the bottom of the harp was simplified into straight lines. The transition interrupted the flow, and visually was unappealing. About three hours were required to make and test a curved pattern for the bottom lap joint, but the result was well worth the investment. The sinuous curve now extends unbroken from top to bottom for each side of the harp. This small change elevated the resulting table from tolerable to charming, and rewards those who take a closer look. A picture of the entire table and some details on the genre can be found at www.stephanwoodworking.com/TableDiningVineyard.htm Additionally there are some pictures of antique vineyard tables in my workshop files I’d be happy to share if you’d like to drop by. Antique furniture drawers always involved wooden drawer sides sliding on wooden runners. 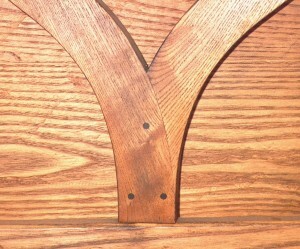 On better furniture, drawers were custom fit to their openings with even, tight gaps. But with use, the drawer runners and bottoms of the drawer sides would wear Eventually the wear was so great that there would no longer be even gaps around the drawer front. A solution developed in England and/or France was to glue a second strip of wood to the inside bottom edge of the drawer sides. This creates a wider bearing surface that wears more slowly. A second advantage of drawer slips is that the drawer sides could be made more narrow, adding elegance and a sense of lightness to the drawer. A third advantage is that the inside of the drawer has much more visual interest. Three types of slips were used, the quadrant pictured here, a cove, and a flush with delicate scratch bead along the drawer bottom. 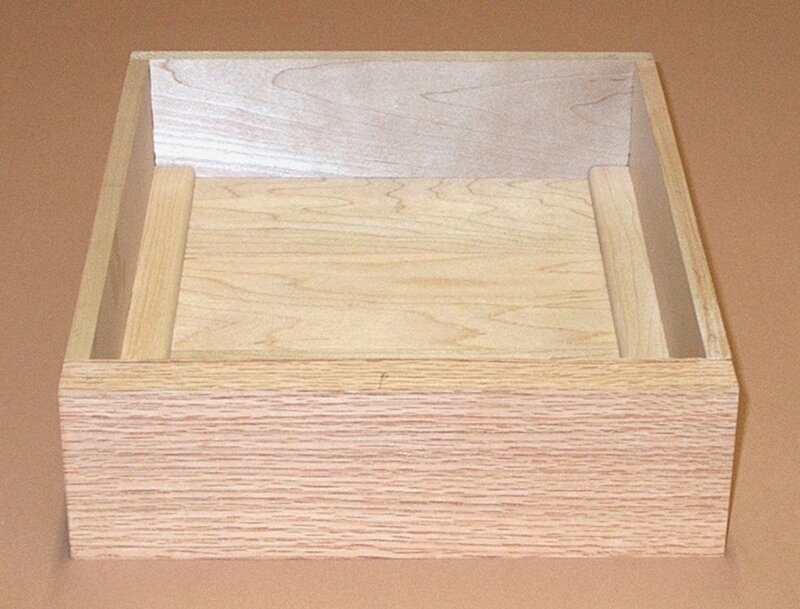 Sample drawers with quadrant and flush slips are maintained at my workshop if you’d like to see them first-hand. It’s a mystery why furniture makers emigrating from those countries to the United States did not incorporate drawer slips in furniture made here. I like to include them for all of the stated advantages.